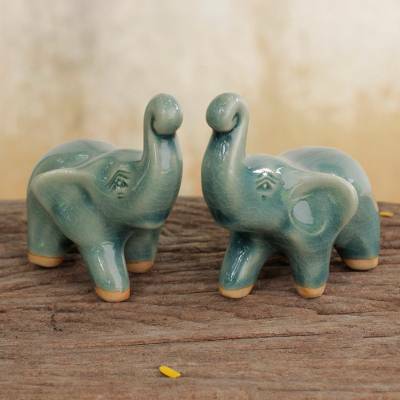 2 Blue Celadon Ceramic Handcrafted Lucky Elephant Figurines, "Lucky Blue Elephants"
Lifting their trunks, two blue elephants trumpet their happiness. An important part of Thai culture, elephants are a symbol of Old Siam. Thatsanee and Ramphan craft the pair by hand in the tradition of celadon ceramic arts, renowned for its subtly crackled glaze. You can find celadon ceramic figurines 'Lucky Blue Elephants' (pair) by Thatsanee and Ramphan in sculpture categories such as Animal Themed Sculpture and Ceramic Sculpture. Enjoy exploring these sections for other Novica treasures.